Production: Decla Filmgellschaft (Berlin); black and white, 35mm, silent, originally tinted in green, brown, and steely-blue; length: 4682 feet. Released February 1920, Berlin. Filmed Winter 1919 in Decla studios; cost $18,000. Producer: Erich Pommer; screenplay: Carl Mayer and Hans Janowitz, from an original story by Carl Mayer and Hans Janowitz; photography: Willy Hameister; production designers: Hermann Warm, Walter Reimann, and Walter Röhrig; costume designer: Walter Reimann. Cast: Werner Krauss ( Dr. Caligari ); Conrad Veidt ( Cesare ); Friedrich Feher ( Francis ); Lil Dagover ( Jane ); Hans Heinz von Twardowski ( Alan ); Rudolf Lettinger ( Dr. Olsen ); Rudolph Klein-Rogge ( Criminal ). Mayer, Carl, and Hans Janowitz, The Cabinet of Dr. Caligari , edited by Robert Adkinson, New York, 1972; also included in Masterworks of the German Cinema , edited by Roger Manvell, London and New York, 1973. Kracauer, Siegfried, From Caligari to Hitler: A Psychological History of the German Cinema , Princeton, 1947. Wollenberg, Hans H., 50 Years of German Cinema , London, 1948. Huaco, George A., The Sociology of Film Art , New York, 1965. Eisner, Lotte, The Haunted Screen , Berkeley, 1969. Manvell, Roger, and Heinrich Fraenkel, The German Cinema , New York, 1971. Everson, William K., Classics of the Horror Film , Secaucus, New Jersey, 1974. Laqueur, Walter, Weimar: A Cultural History 1918–1933 , New York, 1974. Prawer, S. S., Caligari's Children: The Film as Tale of Terror , New York, and Oxford, 1980. Barton, John D., German Expressionist Film , Boston, 1982. Brunner, Stephen Eric, and Douglas Kenner, Passion and Rebellion: The Expressionist Heritage , London, 1983. Budd, Mike, editor, The Cabinet of Dr. Caligari: Texts, Contexts, Histories , New Brunswick, New Jersey, 1990. Hardt, Ursula, From Caligari to California: Eric Pommer's Life in the International Film Wars , New York, 1996. Robinson, David, Das Cabinet des Dr. Caligari , London, 1998. Jung, Uli, and Walter Schatzberg, Beyond Caligari: The Films of Robert Wiene , New York, 1999. New York Times , 4 April 1921. Variety (New York), 8 April 1921. Kracauer, Siegfried, in Partisan Review (New Brunswick, New Jersey), March-April 1947. Melnitz, William, "Aspects of War and Revolution in the Theater and Film of the Weimar Republic," in Hollywood Quarterly , no.3, 1948–49. Luft, Herbert, in Quarterly of Film, Radio, and Television (Berkeley), Summer 1954. Pegge, C. Denis, " Caligari : Its Innovations in Editing," in Quarterly of Film, Radio, and Television (Berkeley), Winter 1956. Lightman, Herb A., "From Caligari to Caligari ," in American Cinematographer (Hollywood), July 1962. Whitford, Frank, "Expressionism in the Cinema," in Studio International (Lugano), January 1970. Helman, A., "Robert Wiene czyli pozory niefilmowosci," in Kino (Warsaw), April 1974. Clement, Catherine, "Les Charlatans et les hysteriques," in Communications (Paris), no.23, 1975.
" Caligari et la critique," in Avant-Scène du Cinéma (Paris), July-September 1975. Carroll, Noël, "The Cabinet of Dr. Kracauer," in Millenium (New York), no. 2, Spring-Summer 1978. Budd, M., "Retrospective Narration in Film: Re-Reading The Cabinet of Dr. Caligari ," in Film Criticism (Edinboro, Pennsylvania), no.1, 1979. Combs, Richard, in Monthly Film Bulletin (London), June 1979. Mazowa, M., "Sleepwalking Through Weimar," in Stills (London), Spring 1981. Budd, M., in Ciné-Tracts (Montreal), Winter 1981. Warm, Hermann, "Naissance de Caligari: Les Trois Lumières," in Cinématographe (Paris), February 1982. Simsolo, Noël, in Image et Son (Paris), October 1982. Cardullo, B., "Expressionism and the Real Cabinet of Dr. Caligari," in Film Criticism (Edinboro, Pennsylvania), Winter 1982. Tomasulo, F., " Cabinet of Dr. Caligari : History/Psychoanalysis/Cinema," in On Film (Los Angeles), Summer 1983. Budd, Michael, "Authorship as a Commodity: The Art Cinema and The Cabinet of Dr. Caligari ," in Wide Angle (Athens, Ohio), vol.6, no.1, 1984. Gout, C., in Skoop (Amsterdam), September-October 1984. Ahlander, L., "Filmhistoriskt nytt: Dr. Caligari och Queen Kelly ," in Chaplin (Stockholm), 1985. Williams, D., " The Cabinet of Dr. Caligari: The Remake," in Film Threat (Beverly Hills), no. 20, 1989. Weihsmann, H., "Die vierte dimension—architektur im film," in Blimp (Graz, Austria), Summer 1989. Schneider, I., "Deus ex animo, or Why a Doc?," in Journal of Popular Film and Television (Washington, D.C.), no. 1, 1990. Cappabianca, A., "Cine/archeologia," in Filmcritica (Rome), November 1990. Kuleshov, L., " Caligari, Mr. West, Aelita: Trois conceptions du film nuet," in Positif (Paris), January 1991. Pratt, D. B., "Fit Food for Madhouse Inmates: The Box Office Reception of the German Invasion of 1921," in Griffithiana (Gemona, Italy), October 1993. The Cabinet of Dr. Caligari is usually identified as the first significant German Expressionist film, exemplifying the narrative and visual traits of that movement. 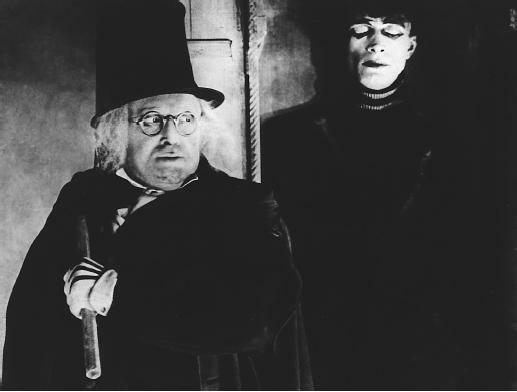 The primary story concerns a series of murders which occur in a German town, coinciding with the arrival of Dr. Caligari who runs a side-show at the local fair. Alan and Francis, friends and rivals for the affection of the same woman, Jane, witness his show; there the somnambulist Cesare predicts the future, and forecasts Alan's impending death. That night, Alan is murdered. Francis pursues the mysterious Caligari as Cesare kidnaps Jane. In the ensuing chase, Cesare collapses and dies. The investigation then leads to a local asylum from which Cesare has reportedly escaped. Dr. Caligari is discovered to be the director of the hospital, gone mad in his obsessive efforts to re-enact an 18th century showman's murders-by-proxy. This story is presented as the narrative account of Francis. The film opens in a park; Francis sits with another man as Jane, in a trance-like state, walks by. To explain her condition, Francis recounts the bizarre events of the central story. At the end of the film, the scene returns to Francis, who is revealed to be an inmate at the asylum. His doctor is actually the Caligari figure from his tale. Upon hearing Francis's ravings in the courtyard, the doctor declares that he now understands the case. The history of the framing device is well known, and is discussed by Siegfried Kracauer in his study of post-World War I German cinema, From Caligari to Hitler . It was not a part of the initial script, by Carl Mayer and Hans Janowitz, but was presumably added by the producer Erich Pommer. According to Kracauer this framing contrivance served to contain the inherent horror of the original story. A study of authoritative madness and abusive power was recast as the delusion of an insane narrator; the evil doctor was re-defined as a benign, ministering figure who can cure the lunatic. At the same time Kracauer sees the final film as a powerful expression of the inherent tensions of the collective German psyche of the period—the fear that individual freedom will lead to rampant chaos which can only be constrained by submission to tyrannical authority. If the original script depicted the potential abuses of absolute authority, the framing scenes concede to this authority and suggest it may be beneficial. But the narrative significance of the film is not necessarily an either/or proposition as Kracauer suggests. The film does start by presenting Francis as a credible narrator. His reliability as a source is only called into question in the final scenes. In this sense the film is more equivocal and expresses a more disturbed sensibility than even Kracauer allows. Indeed, the film simultaneously presents at least two viewpoints on the depicted events: 1) Francis is in fact mad and his story totally or partially delusional; 2) Francis is a reliable source, a position assumed through most of the film. From this second perspective the director of the asylum might be considered a psychotic tyrant whose power extends to include Francis' confinement. One is not, however, led directly to this conclusion. Rather, this version of the narrative causes a disruption of any stable or conclusive perception of character status and narrational authority within the film. This in turn opens the film to a range of possible readings. The film has been seen, for example, in terms of a female fantasy, focusing on Jane as the enigmatic source of the narrative. In other words, the film is structured in such a way that it represents contradictory ways of understanding the central sequence of events. This is supported by the consistency of the film's mise-enscène. The artificiality and stylized exaggeration of acting, decor, and lighting are maintained throughout the film. There are no visual cues to indicate that the world of the framed tale of past events is different from the framing scenes in the asylum. The film's visual style is crucial to its exemplary status within the context of the German Expressionist film movement. In The Haunted Screen Lotte Eisner explains that the overall design scheme of the film creates a pervasive feeling of anxiety and terror. It is characterized by extreme contrasts in light and dark, distorted angles, exaggerated perspective and scalar relations within the decor, and painted backdrops and shadows. The basic tone of the decor extends to costume and make-up. These qualities came to be known as the defining stylistic trait of German Expressionist film. Some critics have argued that German film producers consciously adopted this "arty" style to differentiate German film from other national cinemas (notably American) in order to compete in the international film market. Others have stressed the fact that this movement expresses the troubled state of the German national psyche after the war, or represents a retreat to Romantic despair. In addition, the film's artificiality and subversion of realistic codes of representation have led to discussion of the film as an early example of self-reflexivity and deconstructive processes in the cinema. The film's equivocal narrative and visual stylization combine to create a disturbing fictional world. Moreover, its position in German cinema, and in German history, makes it a compelling case for examining relations between films and their social context. In these terms The Cabinet of Dr. Caligari provides a wealth of material to be mined by film critics and historians.